How does Strensiq® (asfotase alfa) work? Strensiq® treats the underlying cause of hypophosphatasia. 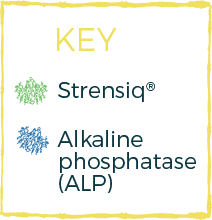 Strensiq® is a prescription medicine that works by replacing alkaline phosphatase. It is used to treat people with perinatal/infantile-onset and juvenile-onset hypophosphatasia. By replacing alkaline phosphatase, Strensiq allows phosphate and calcium to bind and improve bone health. Call 1-888-765-4747 to enroll and be matched with an Alexion case manager!